Common of Mast is an ancient practice that has pigs roaming the Open Forest during pannage season. Autumn has got to be one of my favourite seasons of the year. The annual drifts are underway, the heaths and woodlands are changing colour, adding variety to the hues of the already breath-taking scenery, and pannage season has begun. During pannage season the local people with ‘Common of Mast’ are allowed to turn out their domestic pigs to roam on the Open Forest. (Pannage season this year runs until Sunday 13th November 2016). The pigs eat the forest seeds and nuts, such as beechmast and chestnuts, and provide an essential service to the Forest ecology by eating up the green acorns that are poisonous, in large quantities, to the free-roaming livestock and deer. This free-range foraging is also the traditional way of fattening up the pigs prior to slaughter, before the worse of the winter privations set in. Pannage has been observed since ancient times and is, therefore, a customary part of the New Forest calendar. 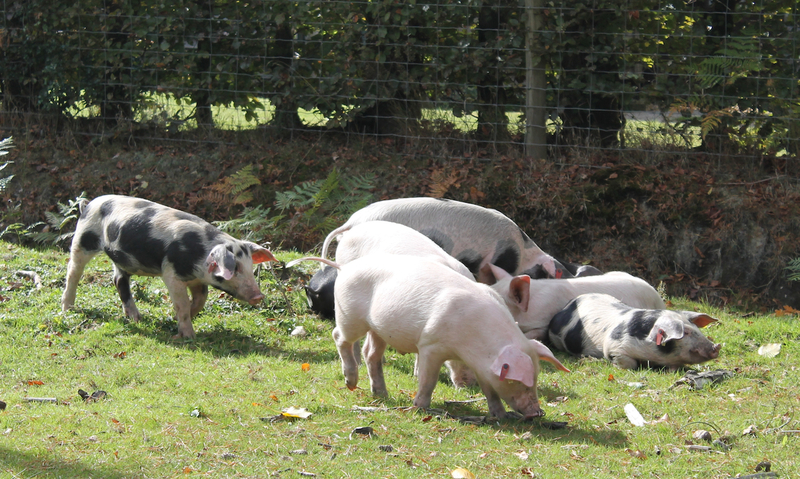 Everyone looks forward to the sight of pigs and piglets rooting about in the undergrowth, providing a welcome addition to the spectacle of other free-roaming commonable animals. In times past pigs did not have a favourable reputation, being described by one seventeenth century text as having ‘exceedingly hard hairs, of a devouring gluttonous Nature, and therefore his head continually looketh towards the ground’ in his constant search for food. This downward-looking aspect, it was believed, meant that the pig could never look up towards heaven (and God) making it a particularly stupid animal. The character of the pig as being fat and lazy seems to have been well established even by the 1600s, as it was remarked that they often grew so obese that ‘they have lain so long in one place that Mice have bred under them’. However, it was considered beneficial to the health of the animal to ‘let it run abroad’, where it would avoid the diseases and illness caused by close confinement in dirty sties. Pigs, it was conceded, were very sociable animals and it was observed that ‘if one Hog be hurt and he beginneth to grumble, all the rest of the Hogs in the same company will come in to him’. Visitors to the Forest, who try to pet or feed the pigs or their piglets during pannage, take note! In 1686, it was stated that there were no wild boars left in England, and there was speculation that ‘it may be supposed that heretofore we had, and did not think it convenient to preserve that Game’. 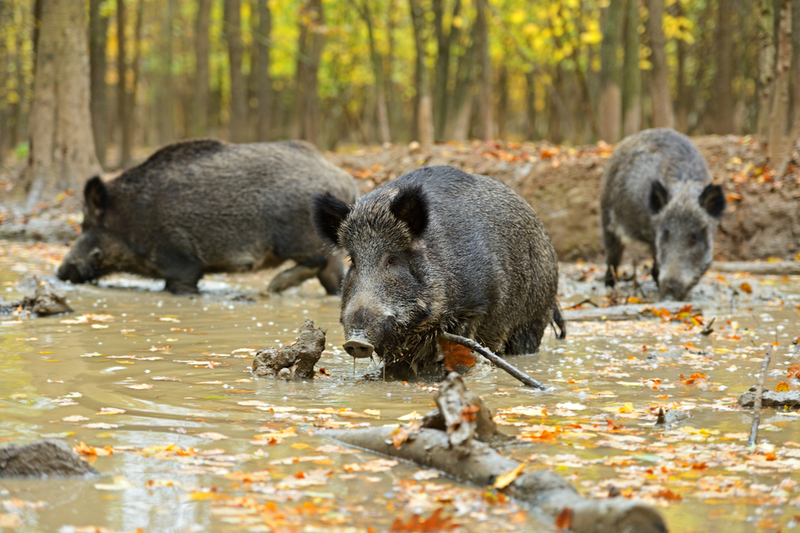 The wild boar was considered a worthy adversary for huntsmen, and the aristocracy used boar hunting as a form of war games where they could practice the martial skills that would be needed on the battlefield. They believed that a wild boar who ‘when he seeth unavoidable death, he singleth out one of the Huntsmen and will run upon him with the greatest rage imaginable, not to be affrighted with swords or sticks’. The boar was considered to have the strength of a lion and given the opportunity ‘will not only throw the Huntsman down, but if he hath no help will kill him’. Charles I had tried to reintroduce wild boar to the New Forest in the early seventeenth century where, it was said, ‘they increased and became terrible to travellers’. These animals were all killed during the English Civil Wars but, according to legend, not before they had bred with the domestic Forest sows and ‘tainted all the breeds of pigges in the neighbouring partes, which are of their colour; and kind of soot colour’. It is doubtful if any of the progeny from these pairings have survived. Nowadays the only wild boar on the New Forest are farmed-kept and were introduced by an enterprising farmer only a few years ago. Wild boar once roamed freely in the New Forest but by the C17th were extinct. Wolfgangus Franzius, The History of Brutes, Or, A Description of Living Creatures (London, 1670), p. 127. Nicolas Cox, The Gentleman’s Recreation, Third Edition (London, 1686), p. 54. John Aubrey, The natural history of Wiltshire: written between 1656 and 1691 (London, 1847), p. 59. This entry was posted in New Forest, New Forest customs, Pannage season and tagged acorns, Beech, Charles I, chestnuts, Common of Mast, commoners, English Civil War, hunting, New forest, Pannage, pigs, Rights of Common, wild boar. Bookmark the permalink.